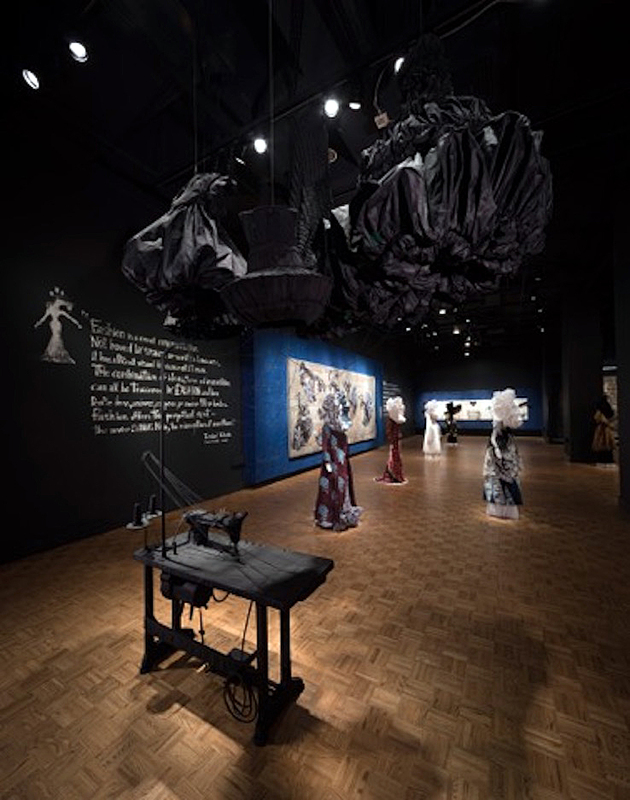 As part of the kick-off for the Detroit Art Week events, the Detroit Institute of Arts mounted an exhibition coordinated by Laurie Ann Farrell, department head of contemporary art at the museum and curated by Amani Olu, Repetition, Rhythm, and Vocab, features the visual art of Carole Harris and Allie McGhee. 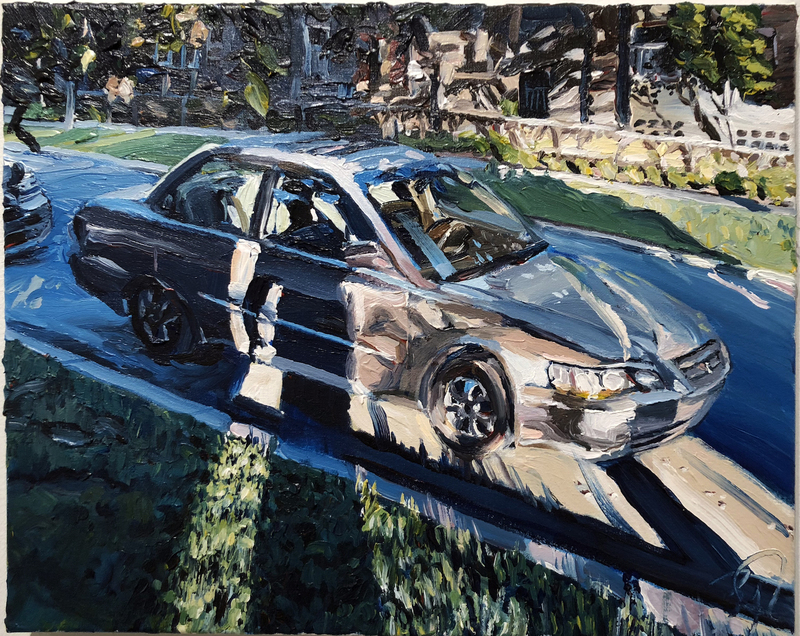 Both artists have been prominent in the Detroit art community for over forty years, each delivering their own individual language of abstraction. The celebration commenced with a talk, and this writer was pleasantly surprised to see a full house of guests in the DIA auditorium where the artists gave a part biographical, part philosophical, talk just before the opening of their two-person exhibition in the second floor Robinson Gallery. 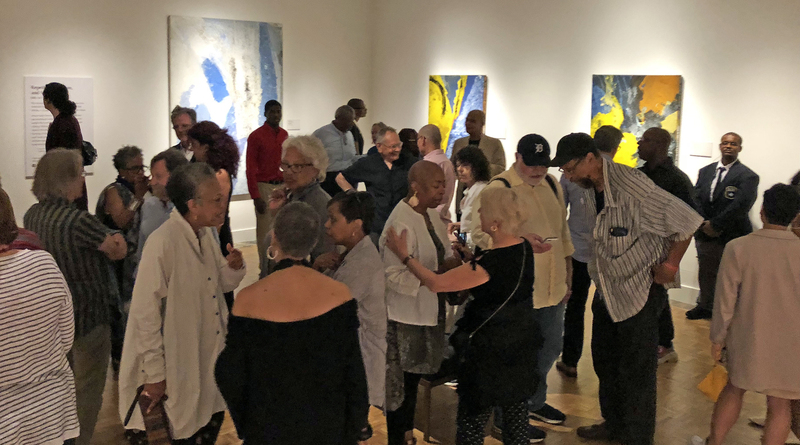 As the talk got underway, both artists shared many common themes, as they both were educated at Detroit’s Cass Technical High School and attended state colleges, Harris at Wayne State University, and McGhee at Eastern Michigan University. They both mentioned the importance of early family support in their pursuit of art, as each told stories about their mother’s influence, and both did not see their work as part of any political movement, or part of Detroit’s revitalization, but more about a constant internal energy to create and evolve as an artist, regardless of politics or race. 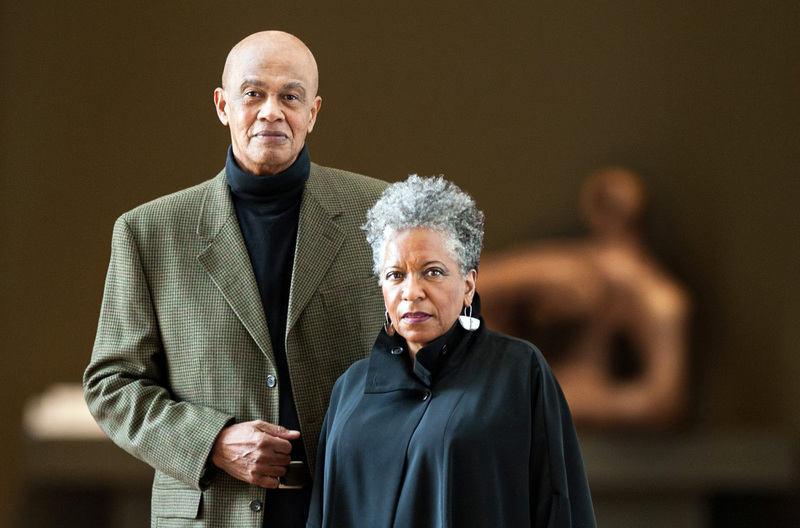 Harris mentioned her work was continually evolving, and McGhee suggested the influence of science, and both gave credit to the impact of the Kresge Foundation for the Arts. 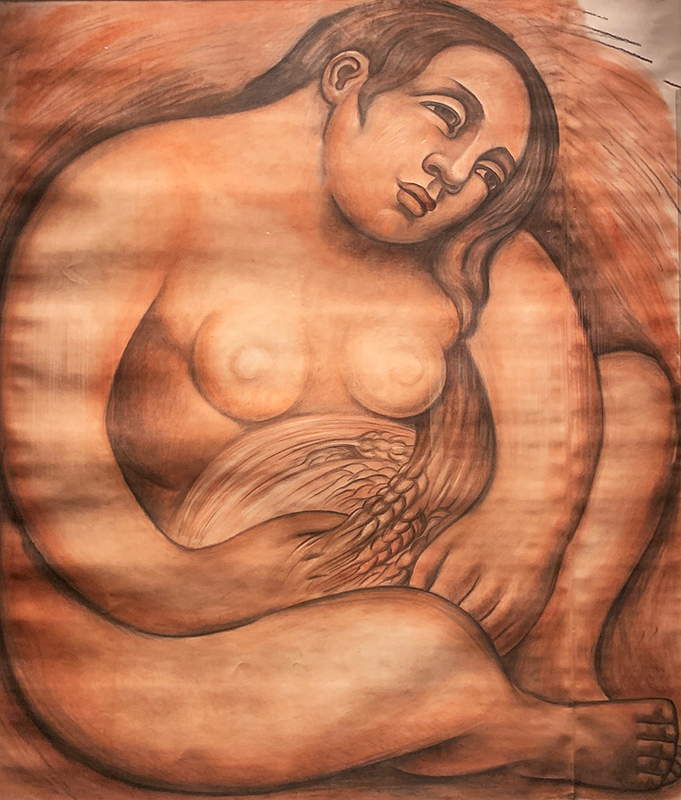 I have written about both artists multiple times for exhibitions at the N’Namdi Center for Contemporary Art and most recently at the Hill Gallery where both artists’ work were present. Allie McGhee has a long exhibition record starting back in in the mid-1970’s. McGhee says he favors using sticks to apply paint rather than brushes. 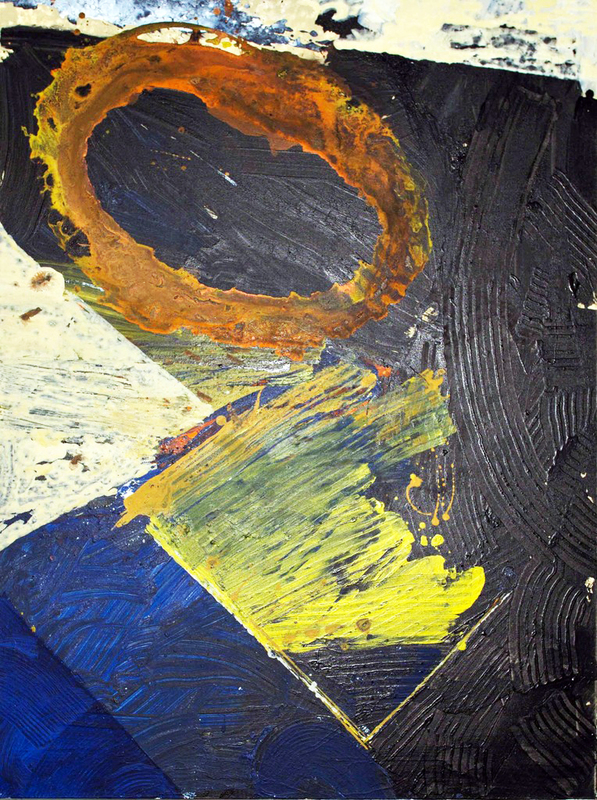 Rejecting the brush, he pulls and scrapes the paint across his material, whether it is canvas or paper. 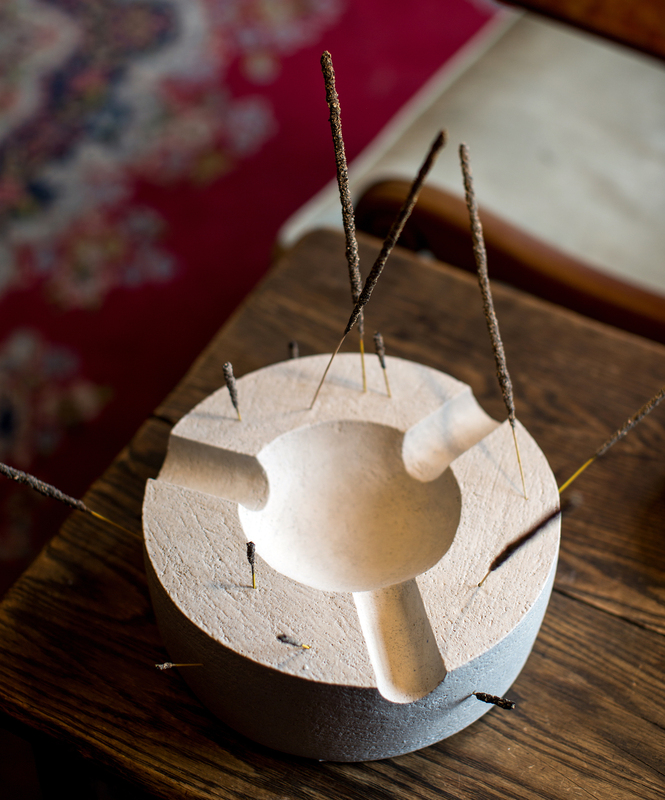 The action of the stick allows McGhee’s hands to interact with the paint and the surface in a visceral way, where the thin paint spatters as he arranges his lathe-like constructions. 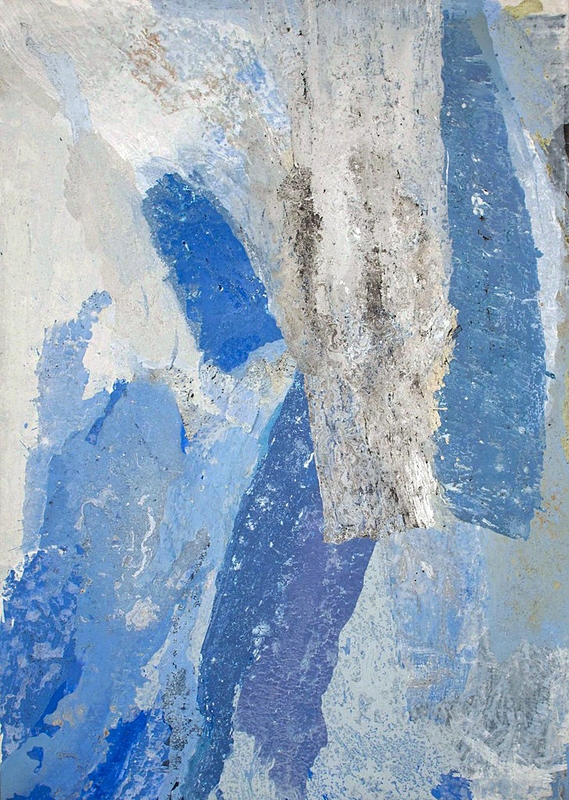 He has often folded thick painted paper into shapes that display themselves as objects on the wall. Music is an apt metaphor for McGhee’s methodology. Miles Davis, one of the artist’s favorite musicians, was an explorer of musical forms who gave up traditional jazz in favor of improvisation. 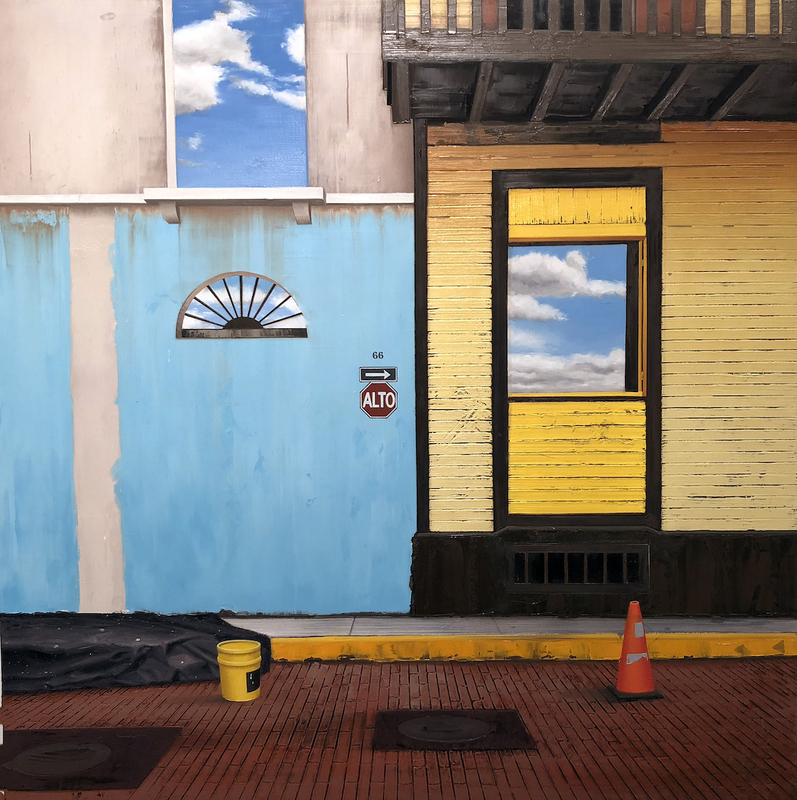 Likewise, McGhee has talked about the art of experimentation, and working every day to explore a variety of paint mediums on a vast range of materials, from canvas to paper, window shades, fiberglass, wallpaper and cardboard. As I wrote about his exhibition Now & Then at the N’Namdi Center for Contemporary Art, “ [McGhee’s] emphasis on discovered and spontaneous correlations that are twisted, crushed and crumpled, remind this writer of John Chamberlain, who worked in a similar fashion but mostly with metal and automobile parts. Given the time period of Allie McGhee’s formative years, the obvious influence here is Abstract Expressionism with shades of Willem de Kooning and Franz Kline that, despite a seemingly spontaneous appearance, maintains a balance of chaos and control.” The steady march of fluid and spontaneous abstract expressionism has elevated the work of Allie McGhee to a significant force in Detroit alongside artists like Al Loving, Sam Gilliam and Charles McGee. The first thing that jumps out from the work Bearing Witnessis not her choice of material, but her use of color, form and composition. The strength she demonstrates draws on her informal use of space, the counter-play of color, and the texture given to torn shapes and line work. Carole Harris and Allie McGhee’s distinct abstract language has evolved for more than forty years. 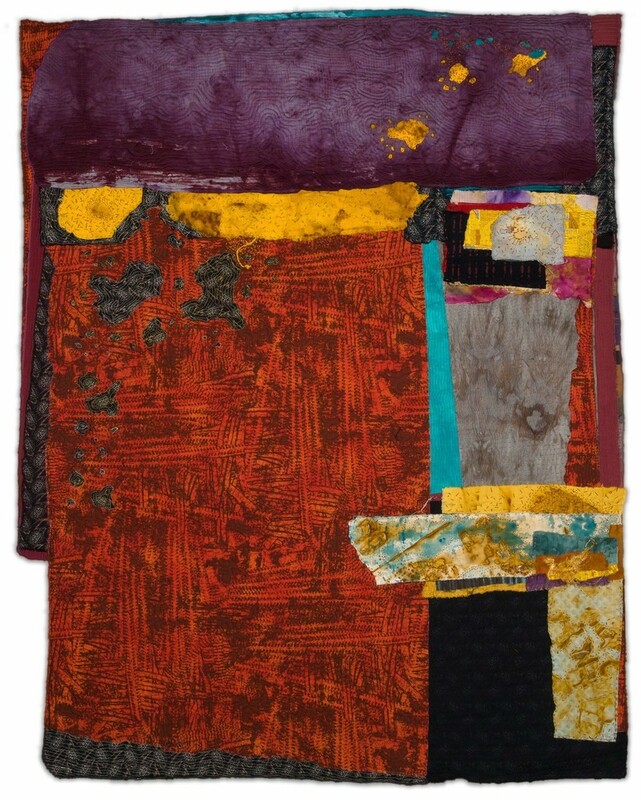 McGhee is a painter whose abstraction rises to the top based on day-in and day-out hard work where he pours his pigment and allows himself to release an intuition to create variations in composition, color and shape. 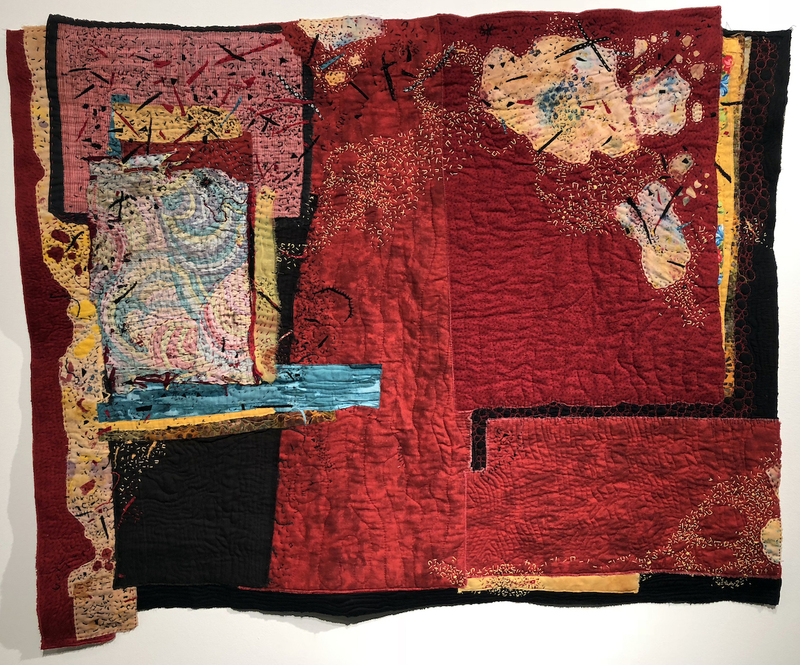 Carole Harris rises beyond the confines of fiber or quilted art, revising her decisions that are usually set in place by a medium that progresses linearly. Both of these artists have endured using a distinct abstract aesthetic that has created an homage to the harmony of an improvisational language of abstract expressionism. In mid-July, during the dog days of summer when the art scene usually lays back and starts to plan and prepare for the fall season, the concept of Detroit Art Week provides some attention to Detroit artists and hopefully creates a tradition for years to come. Museums, galleries, and sites participating in Detroit Art Week include Detroit Institute of Arts, David Klein Gallery, Playground Detroit, Heidelberg Project, Red Bull Arts Detroit, K. OSS Contemporary Art, Wasserman Projects, Public Pool, N’Namdi Contemporary Art Center, Library Street Collective, Holding House, What Pipeline, Charles H. Wright Museum, Simone DeSousa Gallery, Dell Pryor Gallery, Popps Emporium, and Reyes Projects. 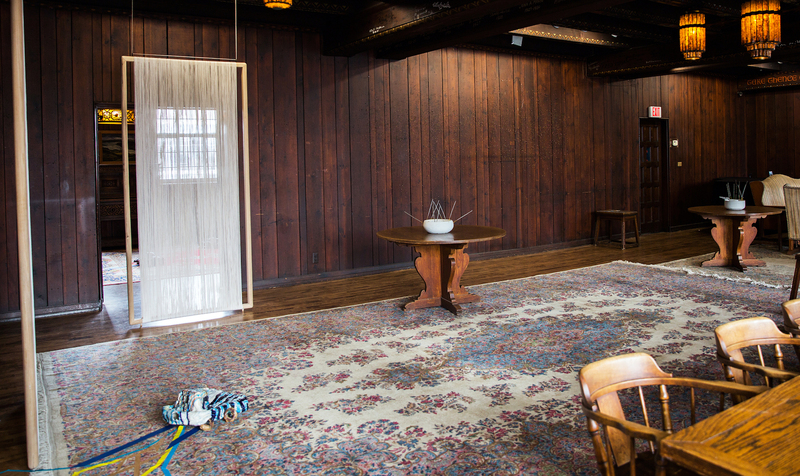 Imagine, while still in high school, walking into a Hollywood costume design studio with your art teacher when, maybe, you’re working on the school play and its set design. Imagine the industry there, the flurry of energetic creativity. You’re behind the scenes where all the magic happens: where the costumes are made, where the bolts and bolts of fabric are transformed into costumes and furnishings for the imaginary world of movies. (Think “Spartacus” or “Ben-Hur” or “Gone with the Wind”). 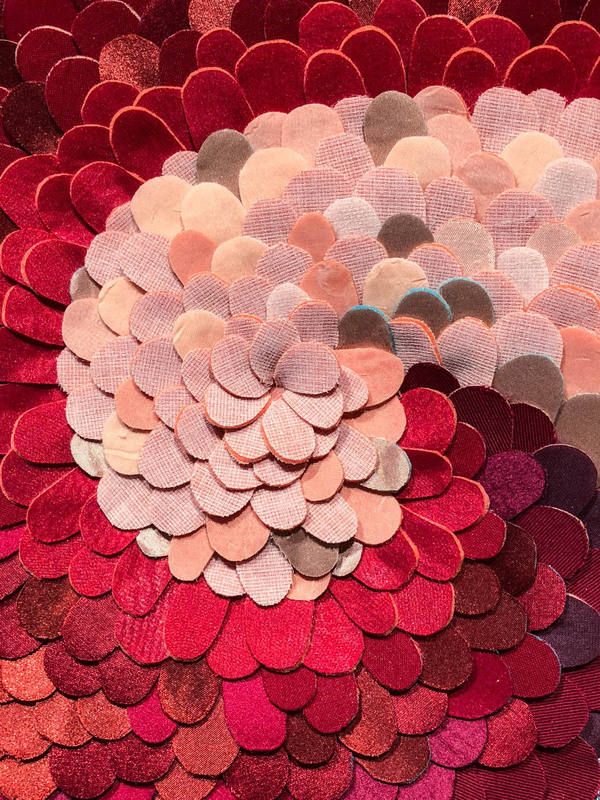 That happened to textile artist Gerhardt Knodel when he was in high school and it seems it was a transformative experience that Knodel took to heart and inspired him to dream very big dreams. 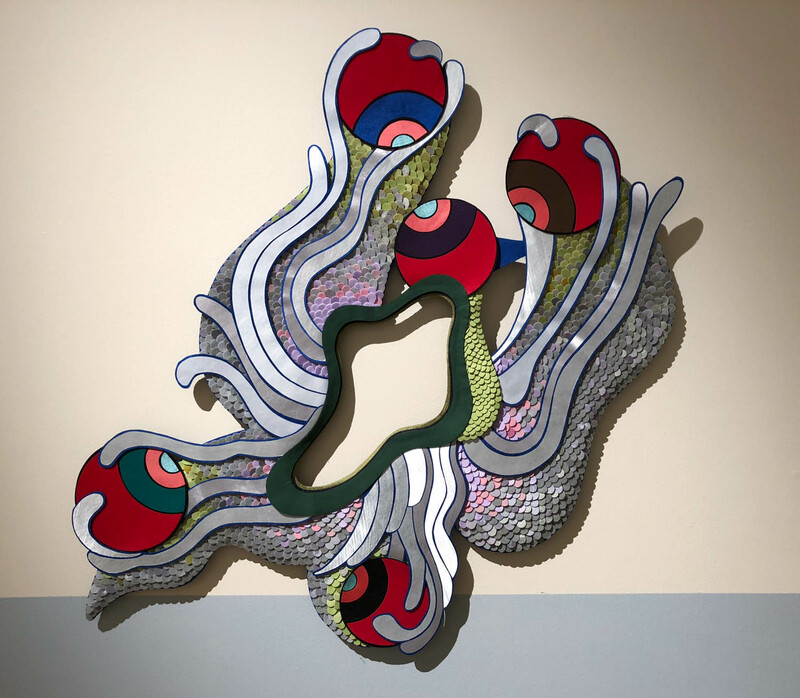 From set designs with painted curtain drops for a high school Christmas play to a seventy-foot-high, textile sculpture that adorned the atrium of John Portman’s Renaissance Center in Detroit, Knodel has been involved in creating and transforming space. “Free Fall” was a series of brilliant, looping, arabesques of color that enlivened Portman’s brutal geometric concrete space into veritable waterfall of color. For years it was on the must-see list for anyone visiting Detroit. He did the same for the new south entrance atrium to William Beaumont Hospital as well, with a multistoried, multilayered tribute to doctors and scientists famed for healing others. 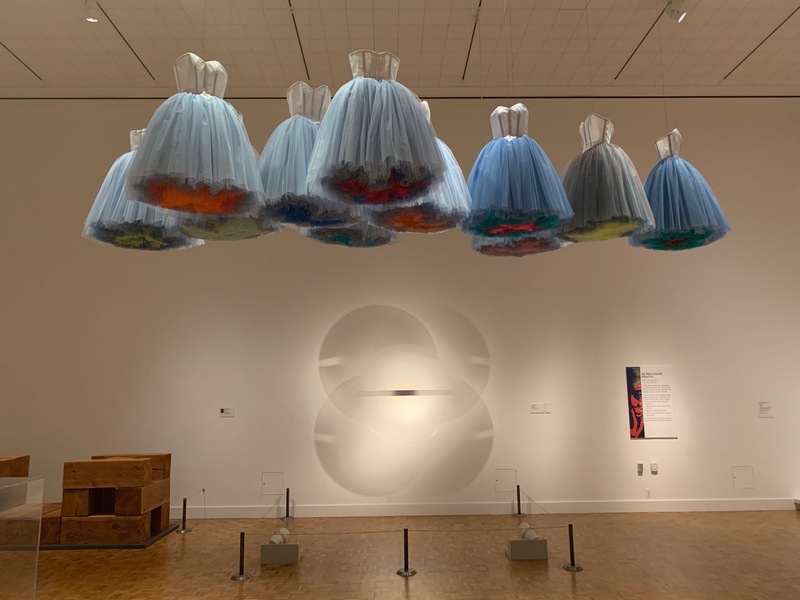 His recent project, “Minglings: A Journey Across Time,” beautifully installed in Saginaw’s Marshall M. Fredericks Sculpture Museum, is no less ambitious or compelling. 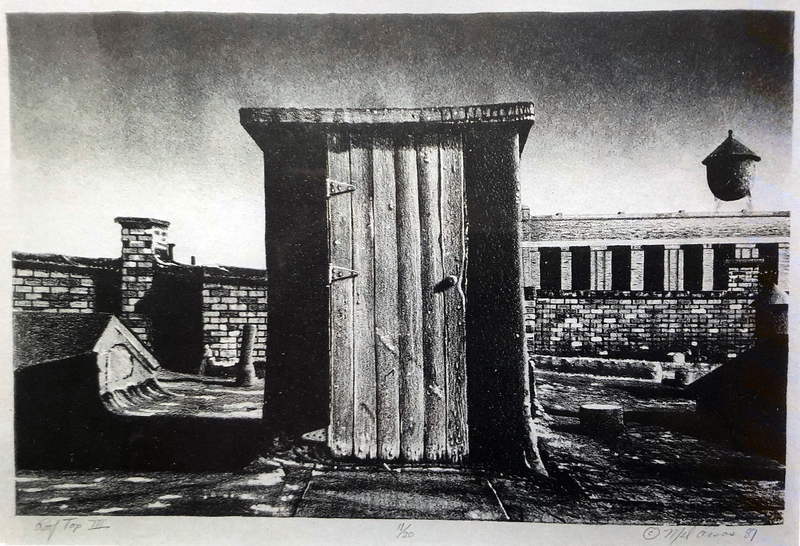 Rather than transforming a space or constructing an environment as he often has, Knodel turned to the other half of the classic philosophical Space/Time conundrum: Knodel explored time by composing a visual historical narrative. 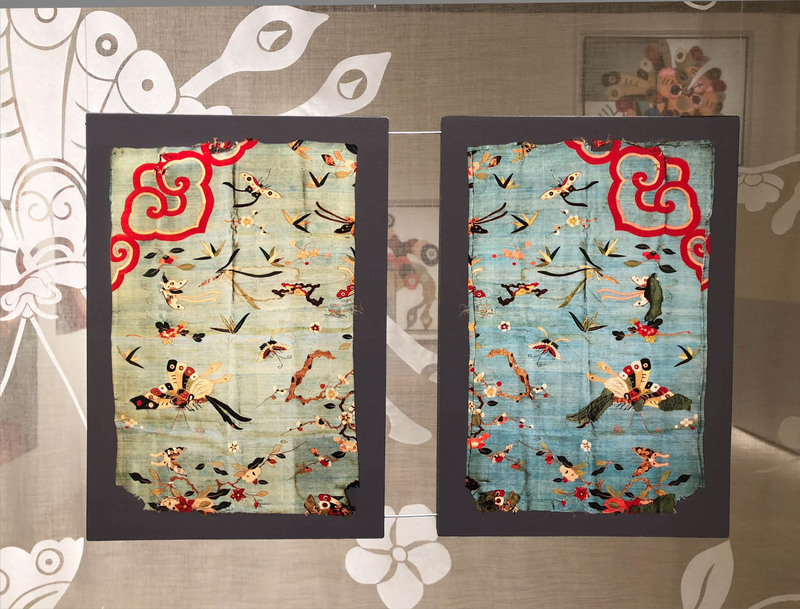 After finishing a large commission and while reorganizing and sorting through his extensive collection of historical textiles in search of a new project, Knodel rediscovered a Chinese silk tapestry. He mused over its beautiful but fragile, deteriorating state. 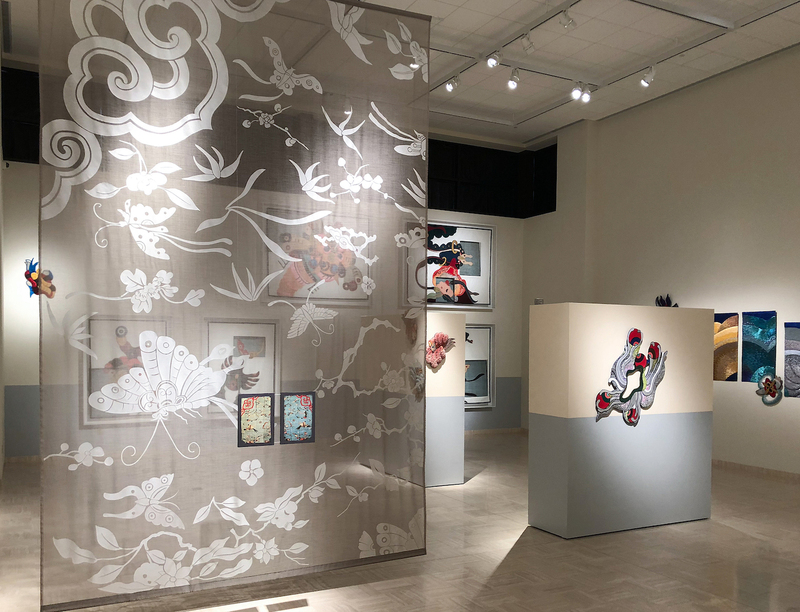 Composed of stylized butterflies, insects, plant leaves and flowers, all floating in a pale blue sky-like background, Knodel realized its possibility. 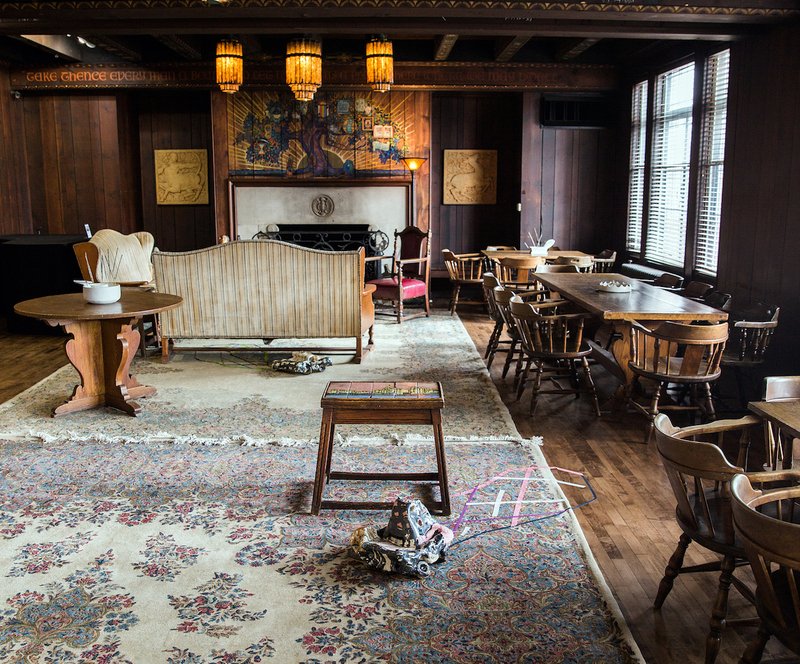 He rescued the deteriorating material by cutting small swatches out of the tapestry that still had physical integrity and contained the essence of its design. In short he played a version of the game of Exquisite Corpse with them, using the swatches as triggers or seeds, as in the game, to draw, as if growing, extensions of them evolving his own inventive forms. Ultimately Knodel drew five different interconnected series that bloomed into a spectacular textile tour de force: along the way he discovered that what he thought were nineteenth century, were (valuable) seventeenth century Ming Dynasty tapestries created for the home of a probably very wealthy Portuguese family. The mistake probably inspired Knodel to dedicate a great deal of creative energy and time in exploring their uncanny charms. Ultimately he composed this engaging, over-the-top, imaginary visual travel log of the tapestry’s voyage from Ming China, by Spanish trade vessels via Manila, to Acapulco, Mexico, then over land to another trade ship and off to Portugal. 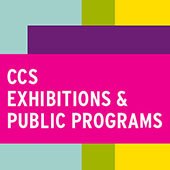 A gallery guide and superb video accompanies the exhibition to help us on the journey. 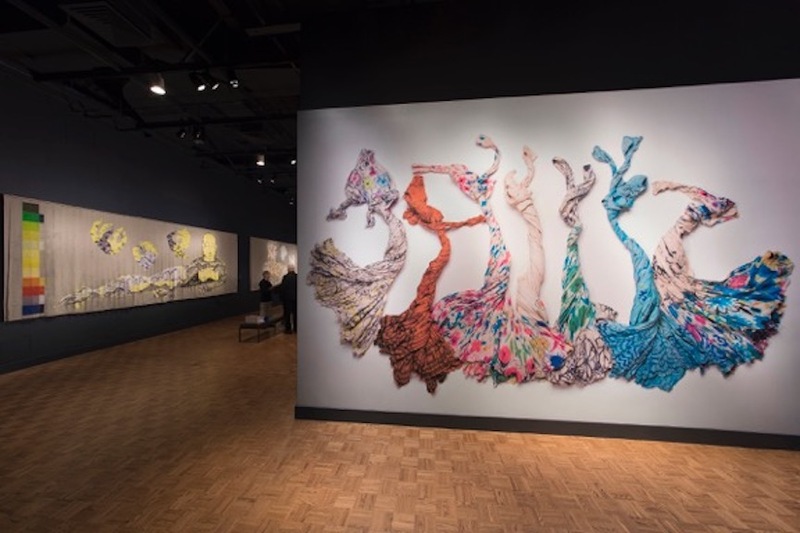 Translating the drawings into textile form involved inventing a medium that would hold up under the artist’s manipulation and give a degree of dimensionality as well as range of nuanced color to his drawings. 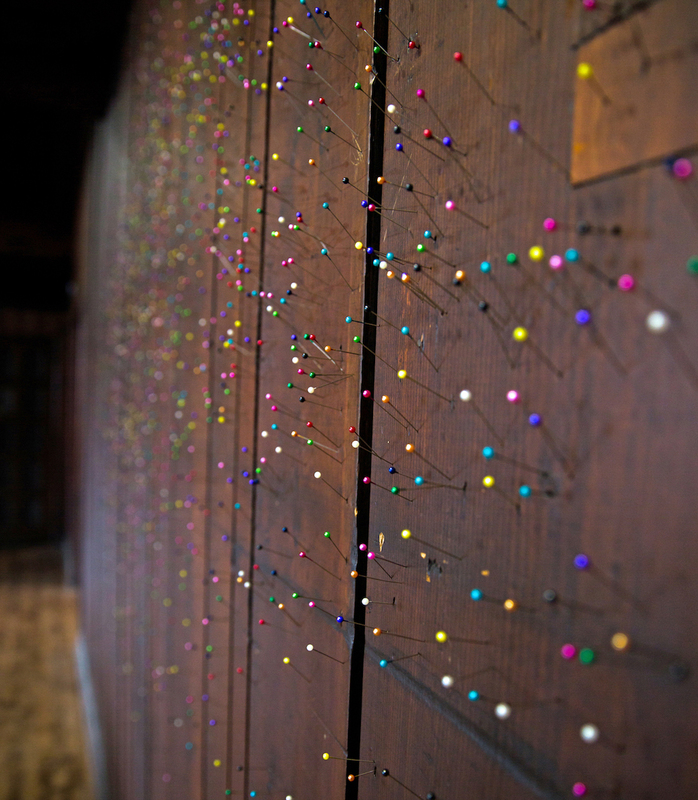 Knodel laminated multiple colors of mixed textiles to foam backing and cut, by hand, tens of thousands, of what he refers to as tabs, which he then blended into a pointillist-like surface (to mix artistic metaphor) or as pixels, to color them. The result of his invention is a breathtaking range of color and exploration of possible forms. There are 58 works in the exhibition that explore the theme of the delicate, weirdness of forms of nature (strange butterflies, insects, vegetation, flowers) suggested by the original tapestry. Knodel’s extension of their forms then are what his poetic vision gave birth to and they represent wonderful explosion of storytelling and delightful imagery. In the initial series, entitled “It Had to Be You,” segmented tendrils with eyes at the end of each of them, explore the world around them. Some of the figures appear like hybrid of sea creatures and insects. The series, “Things That Get Caught in Trees After a Storm,” inspired by one of those uncanny plastic bags trapped in a tree’s limbs, reveal colorful, bulbous, ever-changing forms tangled in branches, blowing in the wind. They are at once exotic and even capture some of the comic extremes of nature. Gerhardt Knodel, “Homecoming: Series #1-6, with “Minglings” #13. Shui, #2.Hui, #5.Mu, mixed textiles. Knodel was revved up, it seems, when he began to realize that his creatures were beginning to have life of their own. Among the “Minglings” are a group of twenty-two, insect-like/sea-like/flowerlike and cartoon-like, creatures that were inspired by the Ming tapestries (so Minglings are spawn of Ming tapestries) and, speculating, of Knodel’s Hollywood upbringing in the cartoon land of Disney. 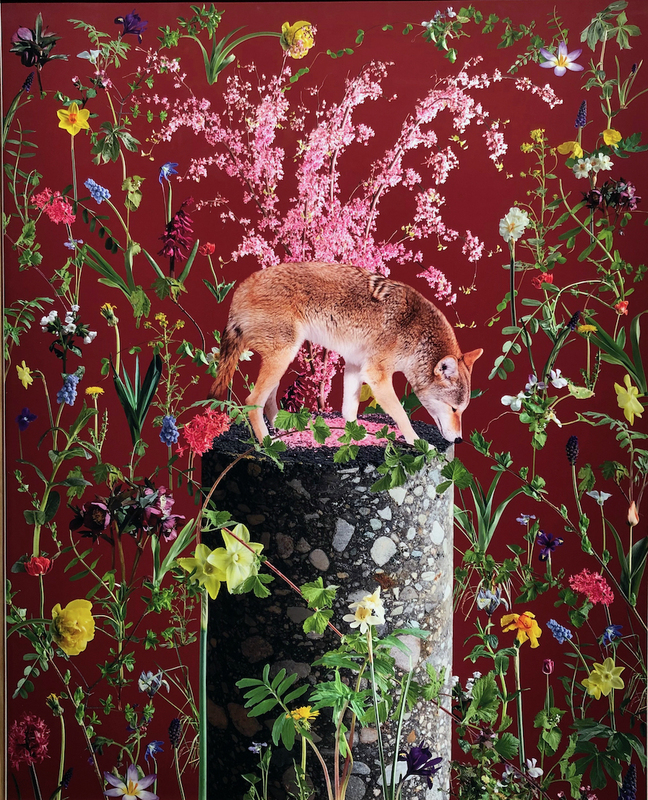 Ranging in size from 24”x24” to 48”x48,” each has its own personality, they all have Chinese names and, in Knodel’s description of his fairy-like tale, make the journey from China, to Portugal to the New World. There are two works that establish a feeling of triumph. 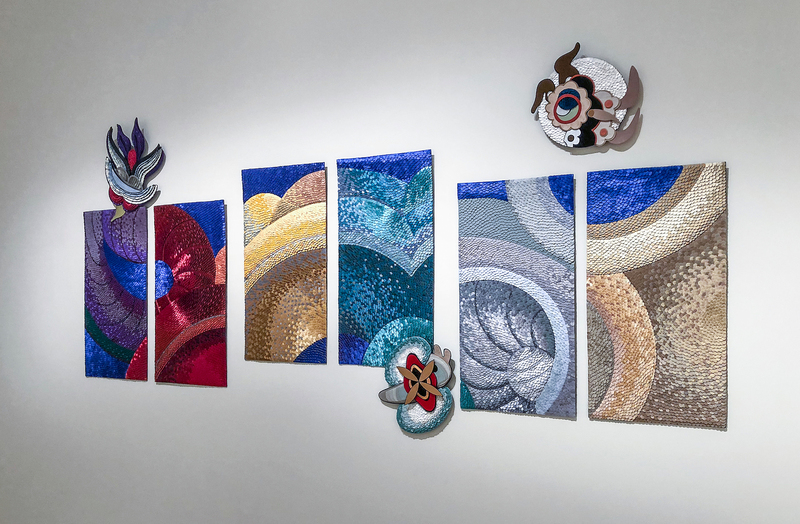 “Flower Powered” is a nine paneled work that celebrates the passage across the multiple seas that the tapestry would have seen. 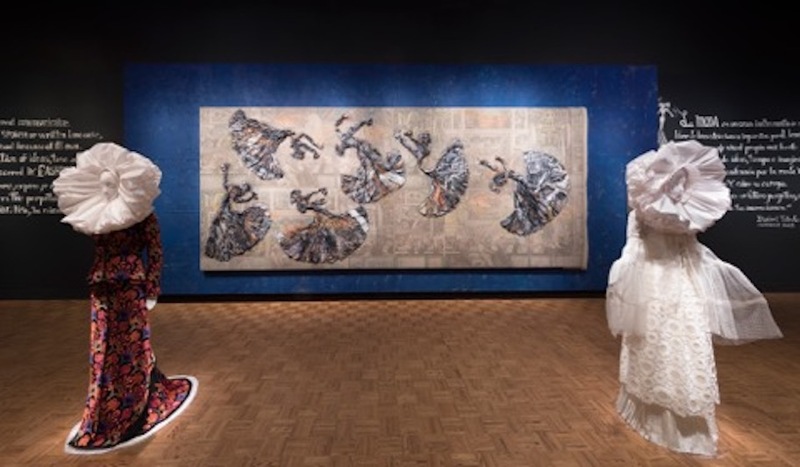 It’s really the abstract center piece of the exhibition and suggests the spectacular landscape of the earth while connecting to the original colors and design motifs of the tapestry. To provide a context, Knodel created a landing site for their arrival in Portugal, entitled “Homecoming,” (pictured with Minglings attached) and to complete their journey until someone else is inspired by his Minglings to continue it and connect with history and extend them even further into the future. There is magic in Gerhardt Knodel’s Minglings project: in his extension and poetic elaboration of the original, in the execution of drawings and the invention of a medium give life to them and fantasizing their journey for his cut up Ming tapestries into a visionary spectacle. He captured something envisioned during one of greatest civilizations ever, the 17th century Ming Dynasty and continued the vision in his studio in Pontiac, Michigan, providing elegant evidence of the timelessness and value of human imagination and labor. It is ultimately a collective victory accumulated over time. 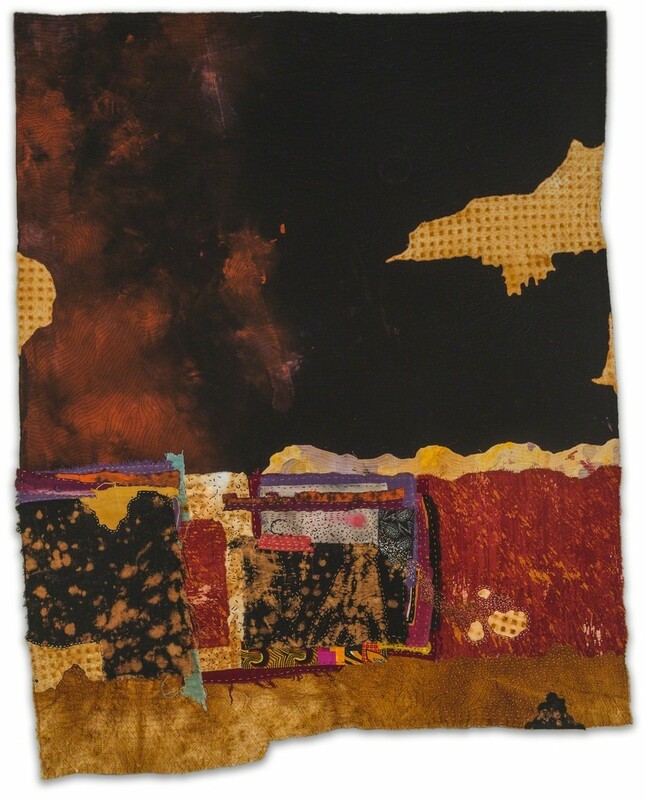 Gerhardt Knodel, “Minglings: Night Flyers (Wei),” 40”x38,” mixed textiles. Also at the Marshall M. Fredericks Sculpture Museum see: “Chinese Folk Pottery: The Art of the Everyday” curated by Marie Woo.